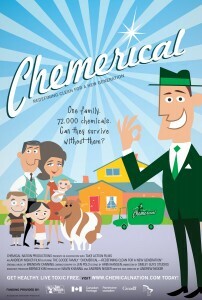 “Chemerical” – film by Andrew Nisker. The “raw-ness” one saw and felt for this relatively ordinary family that the filmmaker had found through a posting on Craig’s List is touching. evidenced by their storing some of the old cleaners in the garage and, like an addict, sneaking out there when no one was looking to grab a couple, falling back on old habits. After a number of family meetings, a hurt and crying mother, angry teenagers and a withdrawing father and husband, progress was made. If one wonders if they were under house arrest with tasers at the ready, all they were asked to do was replace their toxic household cleaners and such with non-toxic.This is a wondeful story that we all can learn from and apply in our own lives, making changes that benefit us personally and our environment, which we all rely on for our survival. Dirk is an organic farmer, agricultural advocate, public speaker and managing editor of Synergy Magazine. This entry was posted on Monday, May 10th, 2010 at 10:57 pm	and is filed under MINDFUL LIVING. You can follow any responses to this entry through the RSS 2.0 feed. You can leave a response, or trackback from your own site.